After a thorough evaluation, your dentist can tell you whether you’re a candidate for dental implants. They require adequate bone structure for placement. The first stage of the procedure involves oral surgery in which a specialist places a titanium post into the jawbone for each missing tooth or for the new teeth that will anchor a bridge or denture. Nature will take its course, allowing your bone tissue to fuse with the titanium post. This creates a solid foundation. 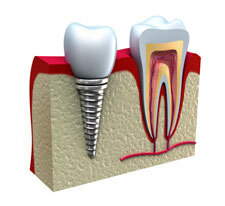 Once the implants are secured, Dr. Kalina will attach a handcrafted, permanent crown to each post. The restorations will match your natural teeth and blend seamlessly with your smile.